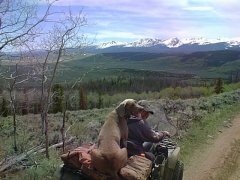 S ubmit your Favorite Riding Spot photo with your ATV, 3 wheeler, or UTV by uploading your photo into this contest category for your chance to win a $25 Amazon e-Gift card. Bonus: The prize value will increase to $50 if there are over 15 entries into this contest. Contest submission period is January 1, 2017 - January 31, 2017. One photo per member allowed, so make sure it's a winner. Photos will require approval into contest after upload. Photos can be of yourself or taken by you. You may not submit photos that you do not have ownership of or permission to use. Any violation of these terms will result in disqualification. Winner will be determined the following month and will receive a $25 Amazon e-Gift card. We've got some cool pics so far. Let's get to 15+ to increase the prize amount. In other news, HMF will be sponsoring February. This is the last week to enter into our January Photo Contest. Please make sure that you get your entry in before the end of the month. The winner will be chosen based on a collective of most likes, most views, most comments, and most activity by our community. So make sure you take a look at the entries and support your choice for winner. Don't forget to click on for each entry you like in the contest to help them win! Submit your photo that shows your exhaust in the image. 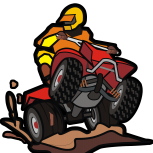 It has to include your ATV, 3 wheeler, or UTV. Upload your photo into the contest category for your chance to win 50% off your next HMF exhaust! That's a huge savings directly from HMF. Contest submission period is February 1, 2017 - February 28, 2017. The contest submission period is now closed. Winner will be announced next week. Thank you to all who submitted to the contest. 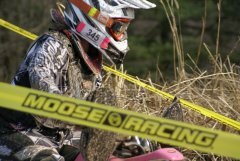 Submit your Outdoors photo with your ATV, 3 wheeler, or UTV by uploading your photo for your chance to win a $25 Bass Pro Shops e-Gift card. More weight will be given to photos that contain a fishing, hunting, camping or similar outdoor theme. Bonus: The prize value will increase to $50 if there are over 15 entries into this contest. Contest submission period is March 1, 2017 - March 31, 2017. Winner will be determined the following month and will receive their prize. We are slightly delayed picking our winner as we are waiting for HMF's input. Should have this announced next week. Congratulations to @atvinme who is the winner of our February photo contest! April Contest Sponsor is Sixity! Will open on 4/2. Our April photo contest is @Ajmboy. Due to the lack of participation in our photo contests, we have made the decision to discontinue running them at this time. Thank you to all the past participants. Our January Photo Contest is now closed for entries. We have decided to do what we have always done with these contests in the past and open it up to the community to vote on a winner. Looks like there are 13 entries. Please take a moment to vote. This poll and topic will close one week from now on 2/8/2017.